Replace worn carpet on your boat trailer's bunks and help protect your boat's finish with this durable, weather-resistant carpet. Marine-grade polyester won't trap in moisture. Resists mold and mildew. Call 800-298-8924 to order CE Smith boat trailer parts part number CE11350 or order online at etrailer.com. Free expert support on all CE Smith products. 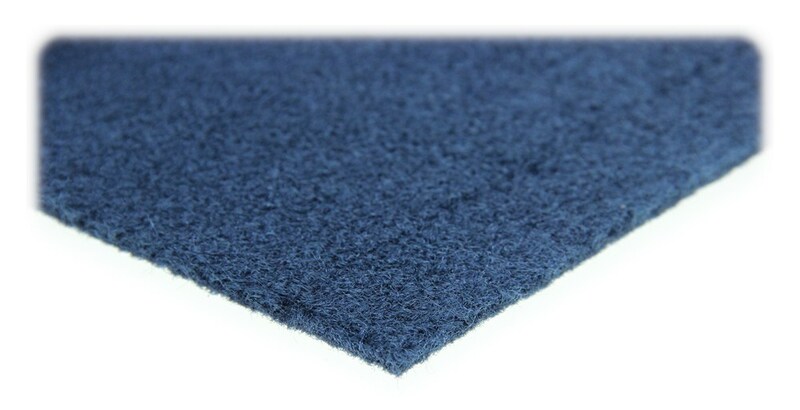 Guaranteed Lowest Price and Fastest Shipping for CE Smith Deluxe Marine-Grade Carpeting for Bunk Boards - Blue - 12' Long x 11" Wide. Boat Trailer Parts reviews from real customers. Replace worn carpet on your boat trailer's bunks and help protect your boat's finish with this durable, weather-resistant carpet. Marine-grade polyester won't trap in moisture. Resists mold and mildew. 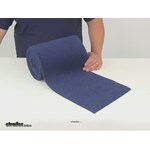 Note: This 11" wide carpeting is designed for use on 2x4 and 2x6 boards. If you use this on your 2x6 bunk boards, some of the board will be exposed on the underside. Over time, the carpeting that covers your bunk boards can wear down or even tear apart. This can lead to scratches on your boat's hull. Replacing the carpeting periodically ensures protection for your boat, and it will also prevent your wooden bunk boards from rotting. To get started, remove the old carpet from your bunk boards, doing your best to remove any old staples and bolts from the boards as well. Cut the carpet to the appropriate length and lay it down so that the backing is facing up, then place your bunk board on top. Make sure that there's enough extra carpet to wrap around the sides and ends of the board. Then wrap the carpet around one side and staple it in place. Once you're done with the first side, tightly pull the carpet around the opposite edge of the board and secure it with staples. Loose carpet can easily snag or tear, leaving the wooden board vulnerable to moisture or damage. Once both sides are securely attached, tuck any extra carpet at the ends in tightly, like you're wrapping a package, and secure the ends to the board with staples. Reduce scratching on the hull of your boat by replacing the worn carpet on your trailer bunks. Roll measures 1' x 12'. Black color. These carpeted bunk boards replace your boat trailer's worn-out bunk boards. Each 5-foot-long 2x4 is covered with durable, marine-grade carpet that helps protect the finish on your boat's hull and is easy to clean. These carpeted bunk boards replace your boat trailer's worn-out bunk boards. Each 6-foot-long 2x4 is covered with durable, marine-grade carpet that helps protect the finish on your boat's hull and is easy to clean. Roller Shaft with Pal Nuts for Boat Trailer Rollers - Zinc-Plated Steel - 13" x 5/8"
Today we are going to be taking a look at Part Number CE11350. This is the CE Smith Deluxe Marine Grade carpeting. It's going to have a nice, soft velvety finish to it. That's going to a good job when it comes to replacing the worn out carpet on your trailer bunks. This is going to measure 12 feet long by 11 inches wide so it is going to work great on your standard bunks that measure 2 x 4 or 2 x 6. Again, really nice soft fabric so it is going to minimize scratches on the boat's hull. This is a durable, weather resistant material so it is going to do a good job when it comes to resisting mold and mildew. It's going to rinse off very easily and it is going to dry very quickly. It is made in the USA. Here on the underside, we kind of have a flatter surface which allows for an easier installation on to the boards. Again, the entire roll is going to measure 12 feet long. The width from edge to edge is going to be about 11 inches. It has a weight of 16.1 ounces per square yard and a pile height of 5/32's of an inch. You can see it is in a nice blue color. When it comes to the installation, you can trim this if necessary to fit your bunk. Then once you have it to the correct size or maybe you just need the full length, you will want to wrap it tight around the board and we recommend using some stainless steel staples as well as some durable glue to get it fully installed. That is going to do it for today's look at Part Number CE11350. 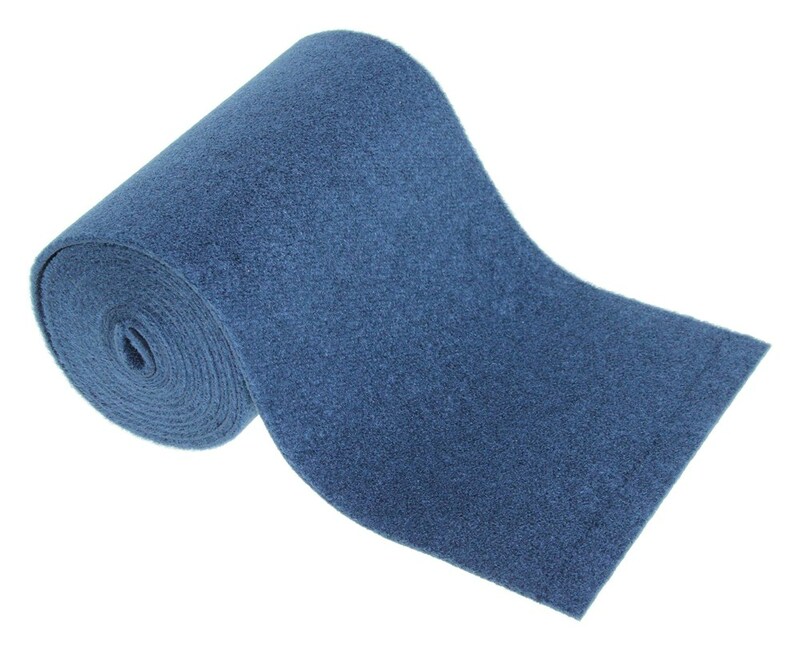 Order: RelevanceNewestRating - High to LowRating - Low to High Replace worn carpet on your boat trailer's bunks and help protect your boat's finish with this durable, weather-resistant carpet. Marine-grade polyester won't trap in moisture. Resists mold and mildew. The carpet has held up well even in the extreme conditions in Mexico where my boat is kept. My captain had no trouble installing installing the new material and the hull of my Grady White is once again protected. I will be a return customer. All products received are performing as advertised. The items mentioned are still working well. I have been so pleased with my etrailer purchases that we bought 4 new tires and rims from you this spring. Paid less for 4 tires and rims than the local dealer wanted for two tires, no rims. The carpet rolls have been working fine. I continued with my trailer restore project and built new bunk boards - 4 each 11 - 12 feet long and carpeted. I also rebuilt the suspension on my trailer - new bolts nuts bushings shackle plates, etc. My trailer and boat loaded up no longer rattle down the freeways. I attached some pics to your response email. Thanks for the update and photos! Still happy with the product a year later. Its held up very well and looks as good as the day it was installed. CE Smith carpet is holding up as expected. Great quality product. Have shopped etrailer for years and have never been disappointed. The fabric I ordered is holding up fine. I am still well pleased with the product. We carry an 18 inch wide carpet for bunks. 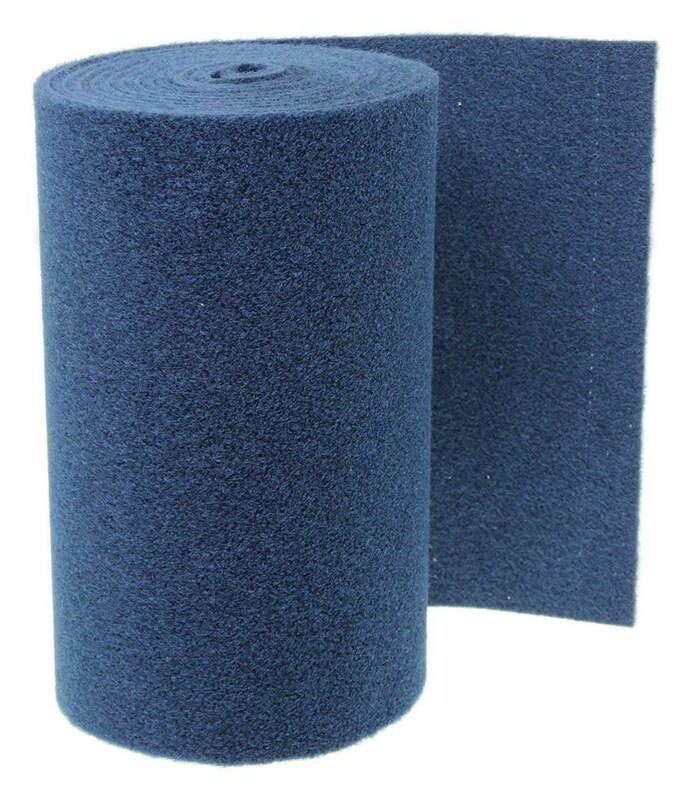 For that you would want the part # CE11349 which is black marine grade carpet sold in an 18 foot long roll. We don't have it in blue though. I attached an install video for you to check out as well. Will CE Smith Deluxe Marine-Grade Carpeting Fray When it is Cut? The CE Smith Deluxe Marine-Grade Carpeting # CE11350 may fray a bit, though not to the point where it will affect the installation or effectiveness of the carpet. If you take a look at the video I have linked for you showing this same carpet (though in a different color) being installed on bunk boards the carpet being cut but without noticeable fraying. The part of the carpet that is cut should also be stapled underneath the boards so it would not be noticable. 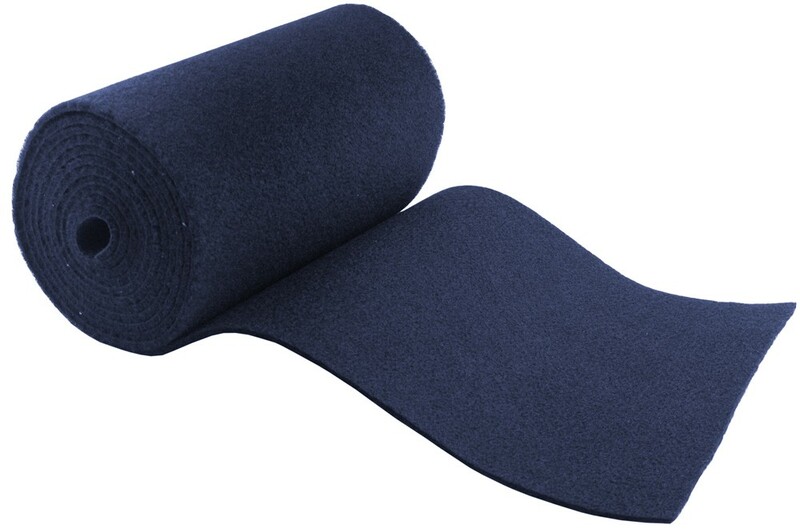 The only blue bunk carpet we have is the CE Smith Deluxe Marine-Grade Carpeting # CE11350 which comes in 12 foot by 11 inch rolls. The closest option we have to the dimensions you are looking for is the part # CE11349 which is an 18 inch wide roll that is 18 feet long. I attached an install video for this for you to check out as well.